I only spent two days in Barcelona but it didn’t even take me that long to learn that Antoni Gaudi is a genius. Gaudi was a Spanish architect who lived from 1852 to 1926. He had a vivid imagination and it shows in his designs. It is clear he was well ahead of his time. It may sound like I am exaggerating as I describe some of the places, but honestly, I was thoroughly impressed. I am not the only one who thinks this, many of his projects have been designated UNESCO World Heritage Sites. One of my priorities was to see as many of Gaudi buildings in Barcelona as I could in my short time there. La Sagrada Familia is a basilica designed by Gaudi, still currently under construction. After more than 130 years, it is scheduled for completion in 2026. I have been to many amazing churches across the world (St. Patrick’s, St. Peter’s, St. Paul’s and more) but in my mind, La Sagrada Familia tops them all. It’s one of the things you must see in Barcelona. La Sagrada Familia under construction for the last 130 years! If you plan on visiting La Sagrada Familia while you’re in Barcelona (and you must) get your tickets in advance! There are several different ticket options but all are timed entry. The cheapest option is to just buy entry into the cathedral for 15€ each. We decided to splurge and go for the most expensive option. For 29€ per person, you get access to the cathedral, an audio guide, and you get to go to the top of the towers on one of the cathedral facades. 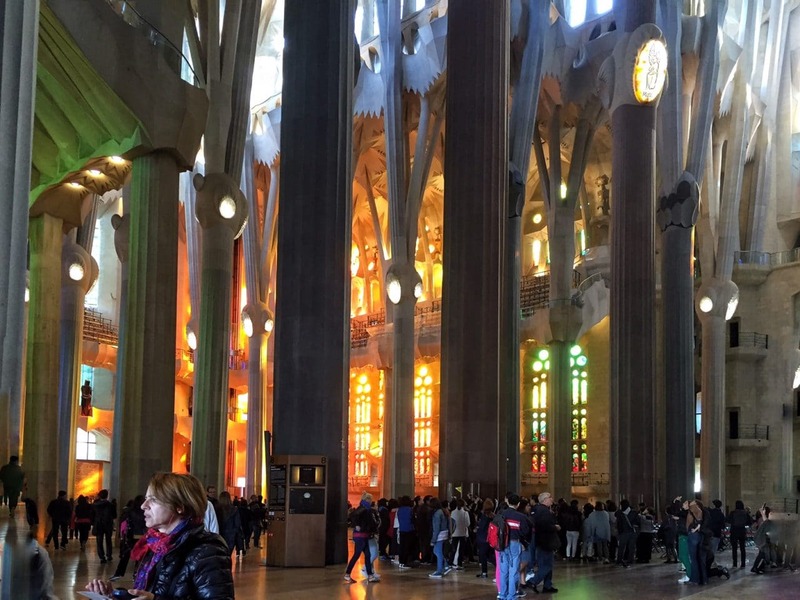 I wish I would have known about this full tour of La Sagrada Familia with an expert guide. The view from the Passion towers of La Sagrada Familia (partially obstructed!). When we booked our tickets, we had to also decide what time we wanted to go up and which side (Passion or Nativity) we would choose. Plus, we needed to decide when we wanted to enter the basilica. We weren’t sure how long we would want to spend inside La Sagrada Familia and I wasn’t sure if we would be able to go back and see the rest of the cathedral after we went up the tower. We booked going up the Passion tower about 45 minutes after our entrance time. You can re-enter the basilica after you go up the tower so the timing doesn’t matter so much. When I was booking I also wasn’t able to find much information about which facade would be the best one to go up, so we just went with the Passion because to me it sounded more interesting. To be honest, I was a little disappointed. I didn’t think the view was worth the extra money. In some spots, the view was blocked by the towers and scaffolding. Plus climbing down the stairs did get a little claustrophobic especially as the line backed up when people stopped to take pictures. Luckily we were able to take an elevator up. Here is a glimpse of some of the impressive detail work on the Nativity facade. La Sagrada Familia looks impressive from the outside even though it is still not finished. You have to get close to see the two amazing pieces of artwork make up the front and back facades. One side tells the story of Christ’s birth (Nativity) and the other tells the story of his death (Passion). Both are totally different styles of art to help emphasize the differences in the two stories. The details in both pieces were very impressive, so and in a way, the artwork reminded me of Auguste Rodin’s Gates of Hell. 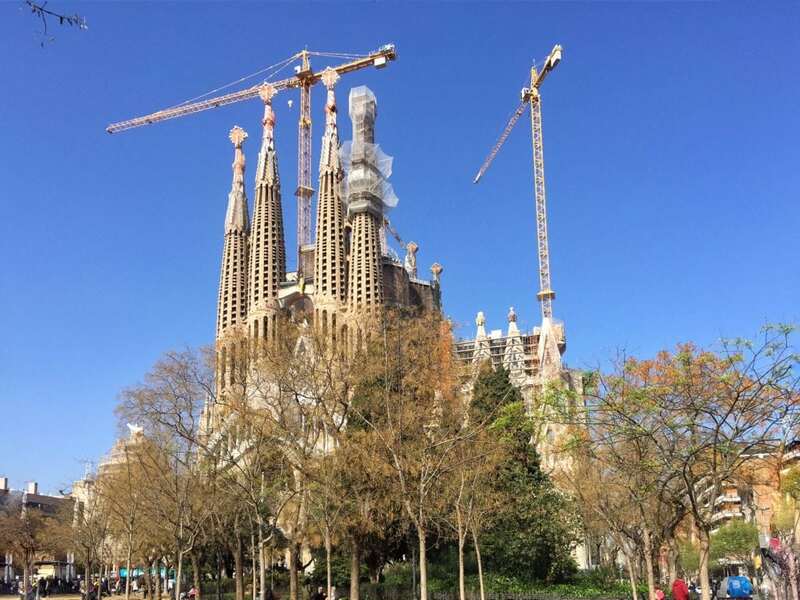 There will be a third facade called Spirit when La Sagrada Familia is completed. While the outside is impressive, I think the inside is even more spectacular. The stained glass is absolutely amazing. I have never seen stained glass light up a place like it does inside La Sagrada Familia. Pictures do not it justice. Plus you don’t get a sense of the sheer size of the basilica. You can see the amazing light from the stained glass window. Overall, I do think La Sagrada Familia is a must see in Barcelona. You don’t get an accurate sense of it from pictures. I enjoyed my visit and the audio tour, just would not get the ticket to go up the tower next time. I can’t wait to see what La Sagrada Familia looks like once it is finally complete. After La Sagrada Familia the next most famous Gaudi site is Park Guell, a public park with both gardens and architectural elements. You can visit Park Guell for free, but to enter the monumental zone, you will need a ticket. Entry to the monumental zone for an adult costs 7€ and a guided tour costs 14€. We again splurged and bought tickets for the guided tour. It is a bit of a hike from the subway so be sure you leave enough time. We ended up basically running across the park to make sure we didn’t miss our tour. Even if you just purchase access to the monumental zone, it will be a timed entry. Tickets for the guided tour or the monumental zone do not include entry to the Gaudi House Museum. This is where Gaudi lived. You can buy a special ticket for La Sagrada Familia that includes entrance to the Gaudi House Museum or purchase it separately for 5.50€. The Gaudi House Museum is located in the free access section of Park Guell so you could visit without paying to access the monumental zone. The tickets you buy online for the Gaudi House are timed entry. Unfortunately, when we visited, we didn’t realize that we needed to buy the tickets for the Gaudi House Museum in addition to the guided tour. The line was just too long, so we didn’t have enough time. I was disappointed because I would have liked to learn more about Gaudi. 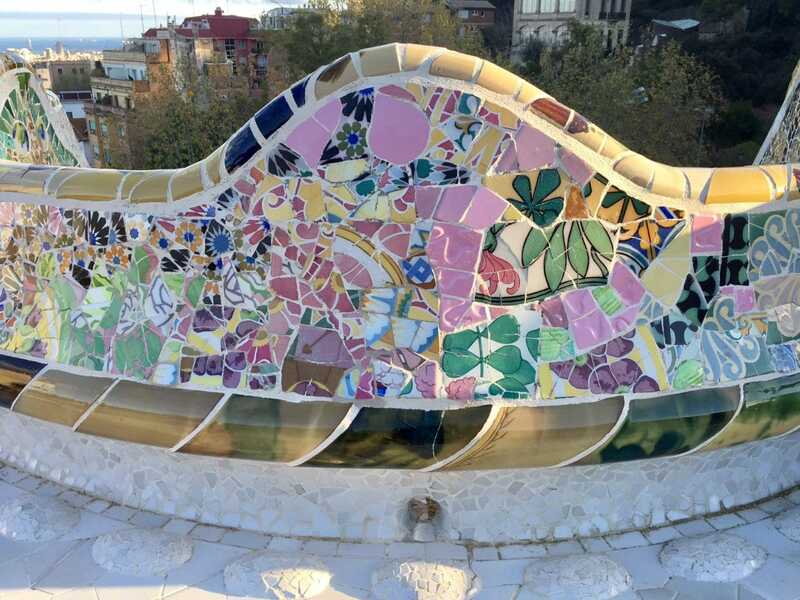 I was impressed by the colorful mosaics in Park Guell. Walking through Park Guell, I felt like I was in a fairy tale. To me, the buildings reminded me of gingerbread houses like the ones in Hansel and Gretel. I also loved all the colors. I felt like it was a place that you just couldn’t help but be happy. In addition to the impressive artwork, Park Guell has pretty impressive views of Barcelona. Park Guell has impressive views since it is located on a hill. I enjoyed our tour too. We learned a lot about Gaudi and the history of Park Guell. 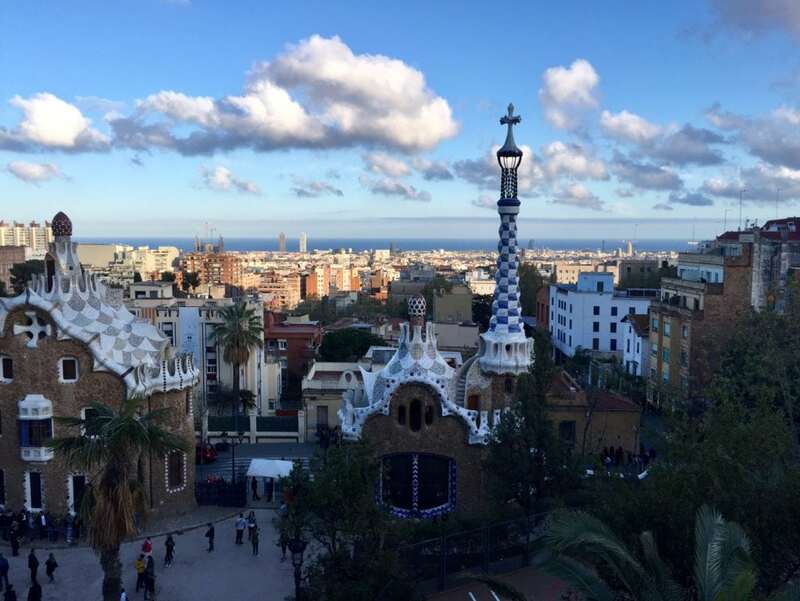 I think the most fascinating tidbit I learned was that Park Guell was considered a failure at the time it was opened because it was supposed to be a neighborhood and not many people were interested in buying the houses. If I would have had three days in Barcelona, I would have loved to see more of Gaudi’s work. Sadly Gaudi’s life came to a tragic end. At age 74, he was hit by a tram. Unfortunately, no one recognized him and did not receive immediate aid. He was only recognized two days later and then died the following day. I plan on trying to see more of Gaudi’s work on my next visit. Have you seen any of Gaudi’s buildings in Barcelona? I would love to hear what you thought about it. La Sagrada Familia is a must see in Barcelona. Be sure to buy your tickets in advance. I would recommend getting the audio tour but not sure it is worth paying extra to go up the tower. You will need to purchase tickets to the Gaudi House Museum in addition to any tickets to visit Park Guell. 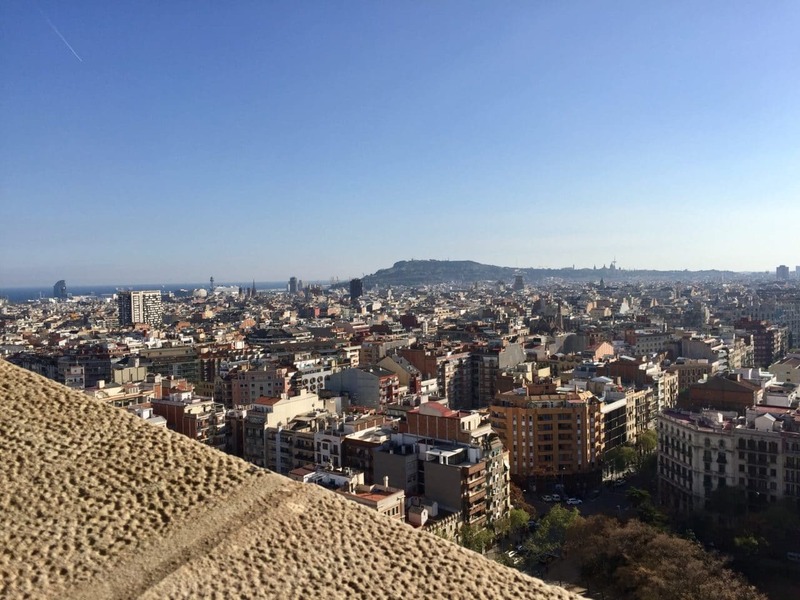 While you are in Barcelona, you should also see the Picasso Museum and La Boqueria Market. If you have time consider a day trip from Barcelona like a visit to Montserrat. We are happy to co-host the Weekly Postcard Linkup. Everyone is invited to join us and share their travel blog posts here beginning at 12 p.m. (PST) / 8 p.m. (GMT) Friday January 20th. The instructions are below, but if you have any questions, feel free to reach out to us. Happy Travels! I agree with you, the specials are not really worth the extra money. Still it is a magical place. I really love this original and powerful church. Thanks and yes the church is amazing! I did a walk through Gaudi’s Barcelona years ago. I’m an architect and I found it fascinating. To pull something like his style off in today’s day and age would be next to impossible due to all the red tape that has gone up over the years. His architecture makes Barcelona truly special. Meg – Nice to hear your perspective since you are an architect. I never even thought about red tape. To me it was more the imagination that he showed by coming up with things so different from anything else. I agree his designs are a big part of what makes Barcelona special. Rosi – Yes I agree, so sad. I hope you get to visit Barcelona too, it’s a great city. Hra – Glad to hear you found it helpful. You are gonna love Barcelona. I also have posts about the Picasso Museum and Monserrat that you might also enjoy. Jessica – Thank you. Glad to hear you are a Gaudi fan too. So which Spanish artist did you end up getting? Barcelona ist still on my list. I am very curious to explore the work of Gaudi. Your detailed blog post gives deep insights. Great motivation! Ricarda – Glad you enjoyed the post and hope you get to visit Barcelona soon. It’s a great city. I LOVE Gaudi and your post brought back fond memories! I actually went on a free Gaudi walking tour which I highly recommend if you ever head back! It takes you to the outside of many of the Gaudi houses and gives a lot of great info. I used that to decide which houses I wanted to visit more thoroughly! Awesome pics and it looks like you had beautiful weather! Cali – Ooh thanks for the tip, that does sound great. Will have to do that next time I’m in Barcelona! I really want to go to Barcelona and visit Gaudi’s sites so this was a super helpful post. I had no idea that you had to purchase separate tickets for the house in addition to the monumental park! Thanks for the tip! Thanks Danielle. Glad you found the post helpful. I hope you get to visit soon, I am sure you will love it! Personally, I didn’t like Sagrada familia from inside (only from outside) the the Guell Park was a great place to take pictures! Katalin – Sorry to hear you didn’t like the inside of La Sagrada Familia, I thought it was magical both inside and out. And yes I agree so many great photo spots in Park Guell. Divya – Thank you! Hope you get to visit Barcelona soon. I didn’t know how Gaudi died, how distressing! Nevertheless both Barcelona and his legacy are easy to love. I saw the Sagrada Familia over 10 years ago – I really must go back and check on the progress! Natasha – Yes such a sad ending. I agree you should go back and see how its coming along! So glad you love Gaudi the way I do. He was my sole purpose for visiting Barcelona a few years ago. When we went to Sagrada the line was like 3 hours long – so we went and ate and came back around 4 or 5 and not a person in sight. We had it to ourselves and boy was it magnificent. I also love his houses and park – the design is how I picture my house to be. Nicki – Wow having the place to yourself sounds amazing! I want to go back and see more of his work! I love the iconic look of Barcelona – it’s definitely on our list to visit! So intriguing to find out how he died too – I had no idea. Incredibly sad though! Thanks for sharing your tips – I’ll definitely be saving this post for our visit. Sarah – Glad you found the post helpful. Yes it is sad how Gaudi’s life came to such a sad end. I think you will really like Barcelona. I totally fell in love with Gaudi too when I visited back in 2007! Especially Park Guell! I was blown away by his distinct creativity and imagination! Stephanie – Glad to hear you loved it too. I really want to go back and see more too. I love Barcelona and all of Guadi’s art! The detail is just incredible. I NEED to go back to Barcelona soon. Yes Christina! Glad to hear you agree. I want to go back too! I’m so excited to read everything you have on barcelona. My best friend is moving there this week and I can’t wait to visit him and see everything. Stephanie – Unfortunately it was a very brief stay in Barcelona. I did also write posts about the Picasso Museum and my day trip to Montserrat. You will love Barcelona, I can’t wait to go back! I’m going to Barcelona for just one day and I hope to see some of Gaudi’s amazing creations! Thanks for the great tips! Ionna – Excellent, you will love it! I’m disappointed I didn’t get a chance to see La Sagrada when I last visited Barcelona as I was also short on time but I too love his architecture. It’s so distinctive and unusual that you can’t help but examine it. I only saw the Casa Batilo when I went but it was plenty fascinating for me. I’ll make sure to follow your tips when I next visit. David – I am glad you got to visit one of his works. I want to go back and see more next time too. Glad you found the tips helpful. 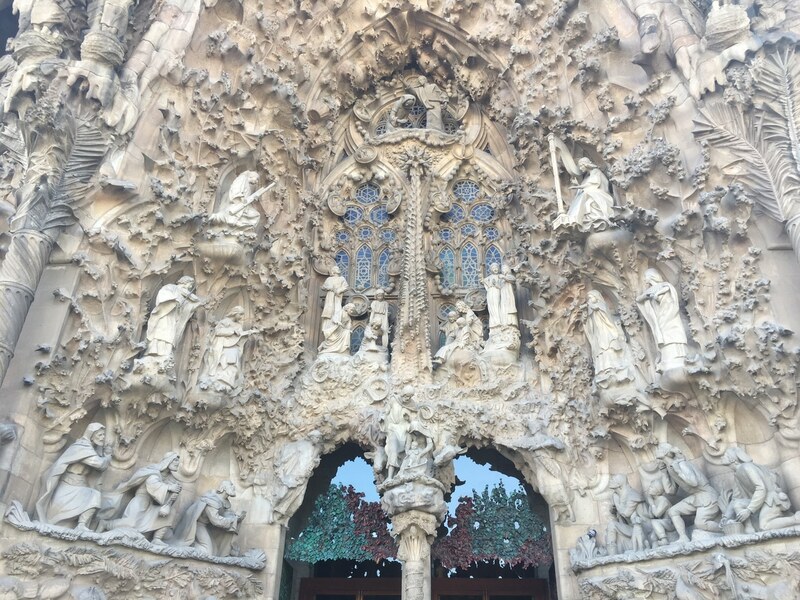 Laryssa – Glad to here you love Gaudi too. I would love to see La Sagrada Familia finished too. It’s already such an amazing place and I’m sure it will be even more impressive when its finished. Lolo – Thanks. I want to go back to and see more of his work. I missed a lot too. Yes Tanja his works really are unforgettable! We are big fans of architecture in the first place, and fans of Gaudi. Put them together and Barcelona is a must! I could seriously live in Sagrada Familia if they’d let me – there is so much to see and explore, and so much innovation. Beyond that, though, Barcelona is such a great city with lots to see and seriously great food. Can’t wait to go back! Rob – Thanks so much. Glad to hear you loved Barcelona too. I am excited to go back as well. I haven’t been to Barcelona yet but it’s high on my bucket list. Of course, i definitely plan to visit La Sagrada Familia and will take your tips into account. Park Guell looks so beautiful too. Sara – Thanks. I know you will love Barcelona. Hope you make it there soon! I’m going to Barcelona in October and cannot wait to see these beautiful buildings. Gemma – Excellent! You are gonna have a great time! I have been dreaming of Spain for a long time, specifically Barcelona and La Sagrada Familia…. this post just added to my wanderlust… 🙂 Thanks for sharing! Elisabeth – So glad you enjoyed the post! I hope you get to visit one day! Upeksha – Glad you found the post helpful. There are so many great places in Spain so it’s understandable you haven’t been yet but I hope you get to go soon! This Basilica is beyond beautiful. I recently stepped into one here in India. I found it gorgeous but it was nothing compared to majesty that this structure presents. Penny – Yes I agree I think it is the most amazing basilica that I have ever been to! Great post! I also fell in love with Gaudi when I visited Barcelona and I can’t wait to get back and discover more of his work. I saw the facade of the La Sagrada Familia, but unfortunately they had sold all tickets for the day and it was our only chance to see it. The next day I went to Park Guell, and isn’t it just spectacular?! Loved the post and reminiscing about Barcelona. 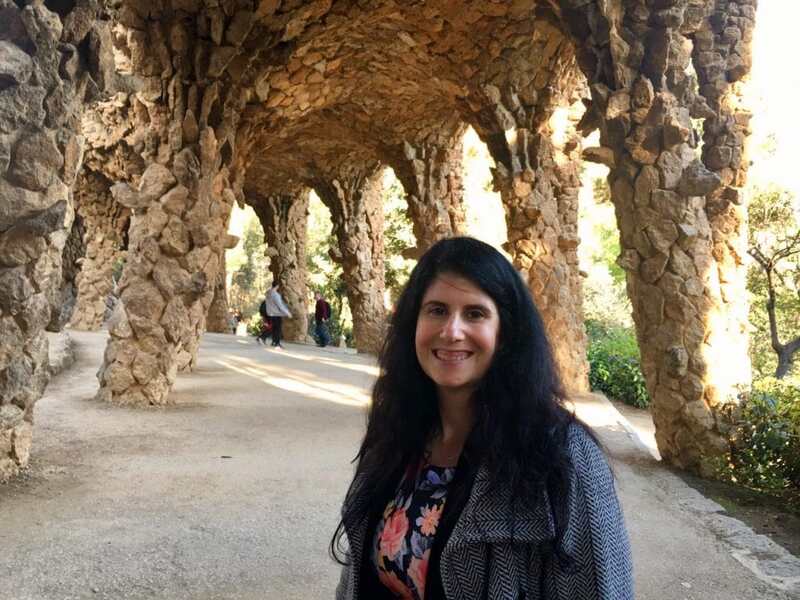 Rebecca – Glad to hear you made it to Park Guell. I hope you get to go back to Barcelona and see the inside of La Sagrada Familia. I’m not surprised you fell in love with Gaudi’s architecture, Anisa. It’s absolutely unique. The first time I saw La Sagrada Familia I thought I was in a dream. I wish I could see that church finally finished. Anda – Yes his work is amazing. I want to see La Sagrada Familia when it is finished too. Annette – You are welcome. I can understand why they keep going back to Barcelona. Under construction for the past 130 years…! Wow! But his buildings do look very interesting, and that detail on the nativity scene is mind-boggling! Bryna – Yes, it is really something you must see for yourself. Thanks Vlad. I definitely agree! I agree that Gaudi is the best part of a visit to Barcelona. It’s been almost 30 years since I visited, and the Sagrada Familia could only be enjoyed from the outside at that time. I’ve always wondered what the interior would be like. That light from the stained windows in your photos is unlike any other church I’ve seen. I would really like to return to see it for myself. Michele – Wow that is fascinating to hear. Yes you must go back and see the progress. I felt the same way as you about Sagrada Familia. It was stunning and so unique, but the scaffolds and construction definitely took away from the experience, not to mention the lines. Casa Batilo was by far my favorite! Thanks Maya! I will have to see Casa Batilo I’m there. We have visited Spain twice and cannot seem to make it to Barcelona. This would definitely be at the top of the list once we make it there. I have a fascination with European churches and cathedrals and I’m sure this one will blow my mind away. The pictures and details are just incredible. We hope to make it before it’s completed 🙂 Thanks for all the tips. Mary – Thank you! There is a lot to see in Spain so I hope you can make another trip to Barcelona. I do think you will be impressed by La Sagrada Familia. I would love to go back and see the progress since my visit and I can’t wait to see it when it is finished.